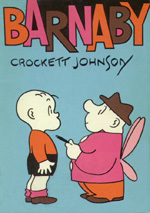 The comic strip Barnaby by Crockett Johnson (best known today for his children's books, such as Harold and the Purple Crayon) featured an almost cherubic-looking five-year-old and his far-from-cherubic fairy godfather, Mr. O'Malley, a short, cigar-smoking man with four tiny wings. Barnaby got in a fair number of scrapes, but most of them were either of Mr. O'Malley's making or resulted in embarrassment of some sort for the rather clumsy fairy godfather. Mr. O'Malley is a member of the Elves, Leprechauns, Gnomes, and Little Men's Chowder & Marching Society. Barnaby's parents deny that Mr. O'Malley is real and take Barnaby to a number of child psychologists. They continue this denial even when Mr. O'Malley is seen flying past their picture window, when he walks into their living room, and even after Mr. O'Malley is elected their representative to Congress. The strip ended when Barnaby finally reached his sixth birthday, the magical point beyond which he could no longer have a fairy godfather. With much regret, Mr. O'Malley left, and so (after a short-lived attempt in the 1960s to revive the strip by redoing the original stories) did Johnson, to pursue other interests. Barnaby was primarily a daily strip, though there was a short lived Sunday strip written by Ted Perro and drawn by Jack Morley, in the mid-Nineteen-forties, which retold the early daily stories. The daily began 20 APR 1942. Crockett Johnson turned the strip over to Jack Morley some time in 1946, but returned to write the final story, which ended 2 FEB 1952. The strip was briefly revived, with adaptations of the early stories minus their Word War II references, from 24 OCT 1960 to 14 APR 1962. It has been reported that these strips were redrawn in Crockett Johnson's style by Warren Sattler. Barnaby received much critical praise when it first appeared, and has been reprinted in Barnaby Quarterly (three issues, 1940's), by Henry Holt and Company (two hardback books, with strips redrawn), Dover books (reprinting the first hardback, 1960's), Ballantine Books (6 paperbacks, 1980's), and in Comics Revue magazine. These reprints still command high prices from used book sellers.